I texted my closest friends today to ask them how they're really doing. The two text answer that sounds a little pathetic. A little too long for a standard "how are you" response. Not the "good, good! busy!" reply that we all seem to send and receive regardless of the circumstances. As the year flies by and days get cooler, it seems important to ask what's happening behind the chipper. When they asked me the same question back, I replied: I'm tired. It may not have been a long response, or a detailed one, but it's absolutely true. I am very tired. Tired of watching my money fall short of "making ends meet" every month. Tired of spending gobs on student loan interest payments. Tired of coming home to cleaning or blogging or after work events. Tired of hearing the hardships others are going through without being able to help. Tired of the sunset at 4:45 (only two days into it and already tired! It's gonna be a long winter). Tired of wedding planning for the better part of 6 months. Tired of watching the world fly by and terrible things happen to everyone in it. But despite the tired, that aching tired that's leaking into my bone marrow, I'm happy. I'm tired and happy. Completely full up to the brim of everything - the good, the bad, the ugly, the full-of-love, and the not-so-full. My container is overflowing. I suppose I am lucky enough to be content in so many areas of my life that I have time to be busy and tired. I have time to sink into bed at 7 p.m. and refuse to get out again until morning. So Ben and I, in our exhausted sighing, in the rain and wind, walking home this evening, decided to make a pizza and buy a six-pack of beer and sit down with Hayao Miyazaki films. We knew that we had to escape into the clouds, into Howl's Moving Castle, and just rest there for a few hours. And here we are, cuddled up in blankets with the cat, flying high above magical towns, just taking a few minutes to breath. 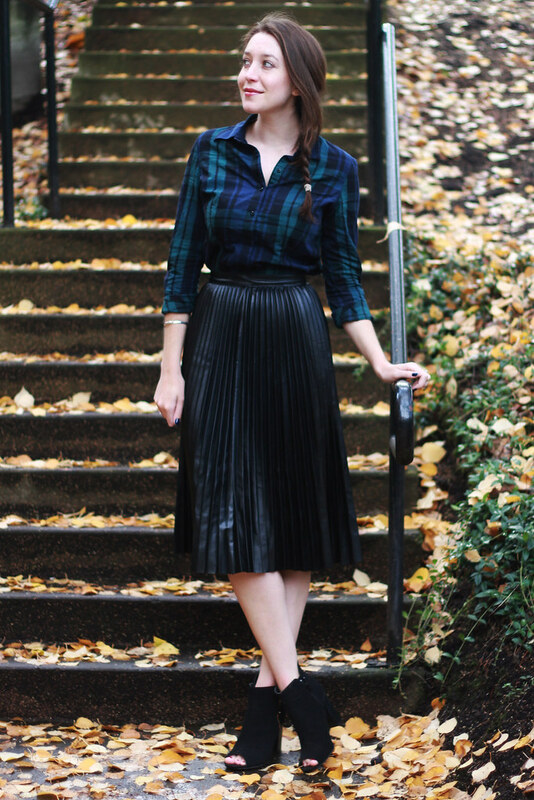 Also, this is such a beautiful and girly outfit, your leather skirt is perfect! oh my goodness, this skirt is stunning. You look amazing! Ugh yes I'm tired too. Money also is the top of the list....it's always something coming up and I'm just so tired with dealing with people who create drama and make problems out of nothing. 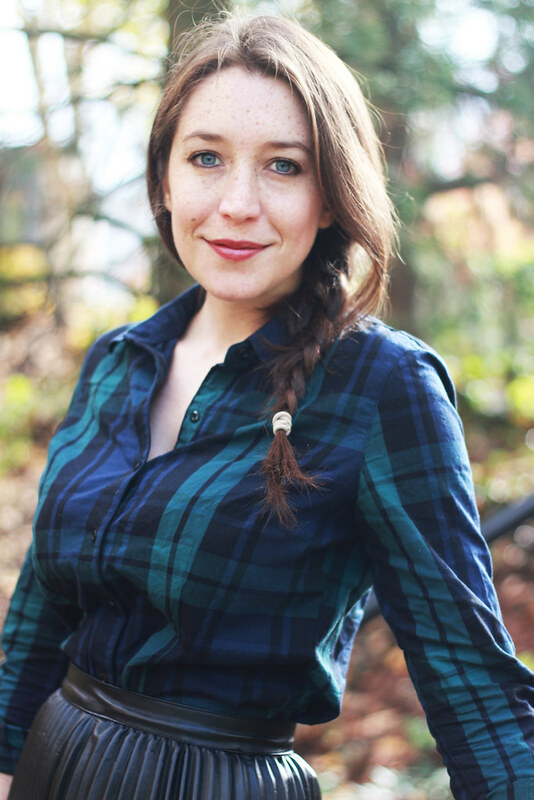 Real women wear flannel and OWN it! Like here. I have a very similar shirt and never would have thought to style it this way. I love it! I love Howl's Moving Castle! Such a crazy, good good film. I also love the shape of this outfit, and you look beautiful. I totally hear you on the exhaustion...glad you were able to take an evening to relax! I know the feeling. I hope some energy and sun infuse themselves into your life soon. I love the Miyazaki films - there is something that is peaceful and yet reinvigorating about them! I think it's important to make downtime plans for TV and kitty cuddling! I love your outfit as well, the blend of the preppie and a longer skirt but that skirt is so urban and hip! 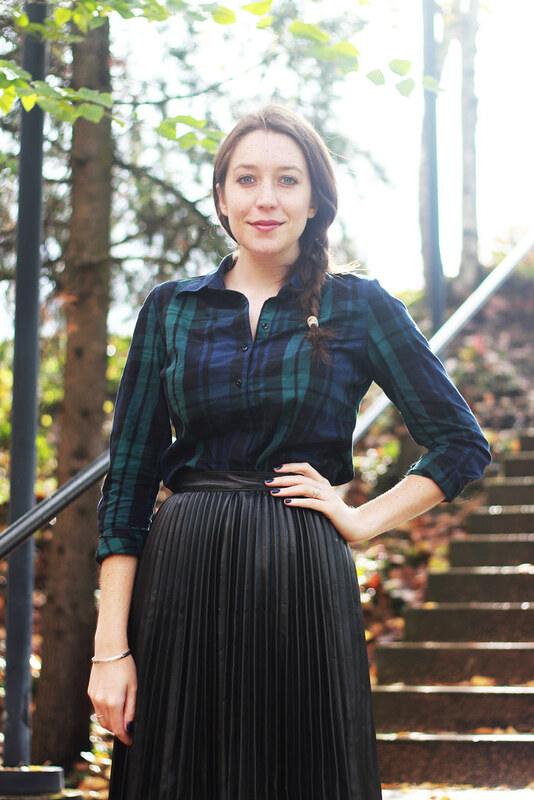 Love that pleated shirt paired with a plaid shirt. I agree, it can be a bit depressing since it started getting darker quicker. You need a day to be able to turn off the world and focus on yourself and have some ME time. I hope you'll have a chance to do it this week. BTW that pleated skirt looks stunning on you! Love the easy braid paired with this! 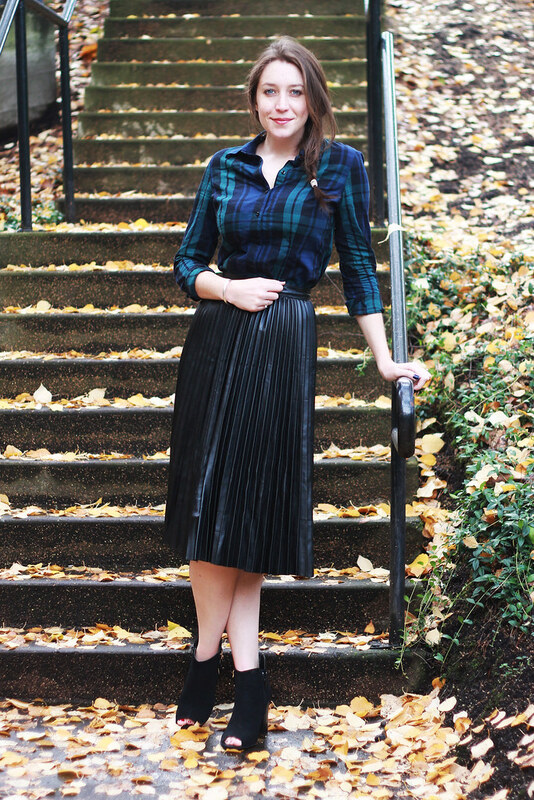 Love that black skirt, I was dreaming of one like that a couple weeks ago as a go-to fall/winter skirt for work! I have been completely feeling the same way this week! Glad you took the chance to have a relaxing evening! 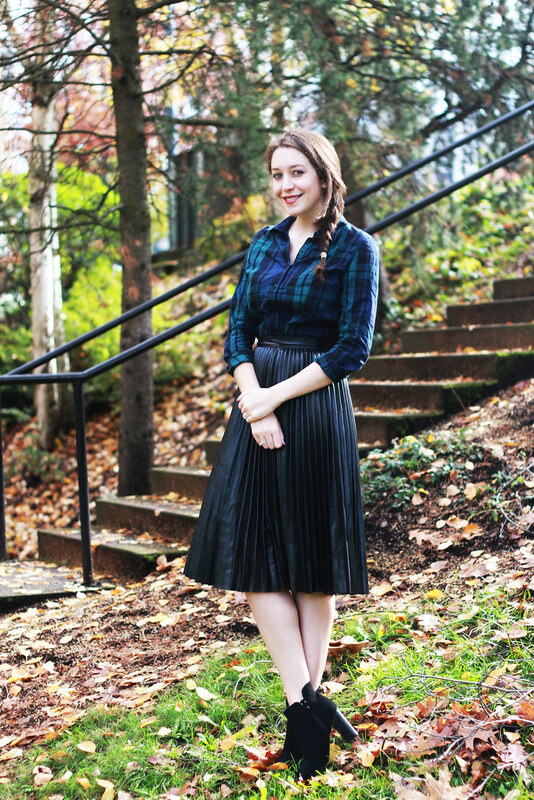 Love love love the plaid with the long black skirt! And I hear you on the tiredness girl. Whenever I feel like that I go take some relaxing time for myself and make sure that I don't feel guilty about it. That adage of "time you enjoying wasting is not wasted time" is so true! I totally hear you on being tired. I feel like I could just sleep for weeks, and then finally have energy to face all the things on my to-do list. 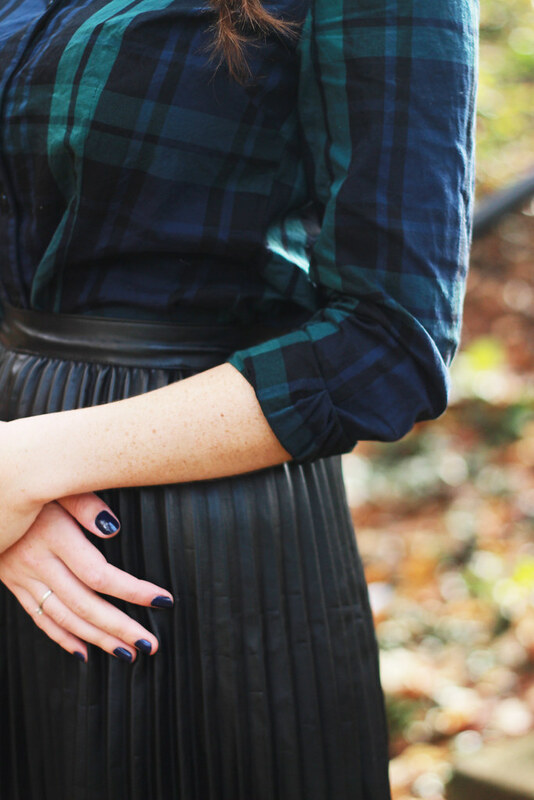 you are my style,i love that plaid shirt and leather skirt,did that skirt frin Zara?